Successfully Added Intelligent 3D Printer Pen - 0.6mm Nozzle, OLED Display, ABS and PLA Filament, Adjustable Temperature, Metal Design (Silver) to your Shopping Cart. Let your imagination come to life with this intelligent 3D printing pen. The RP900A printer pen features a stylish and sleek full metal design, making it not only beautiful to look at but also comfortable to use. The body of the pen measures merely 14mm in diameter and is extremely light in weight, making this stereoscopic pen suitable to be used by people of any age. 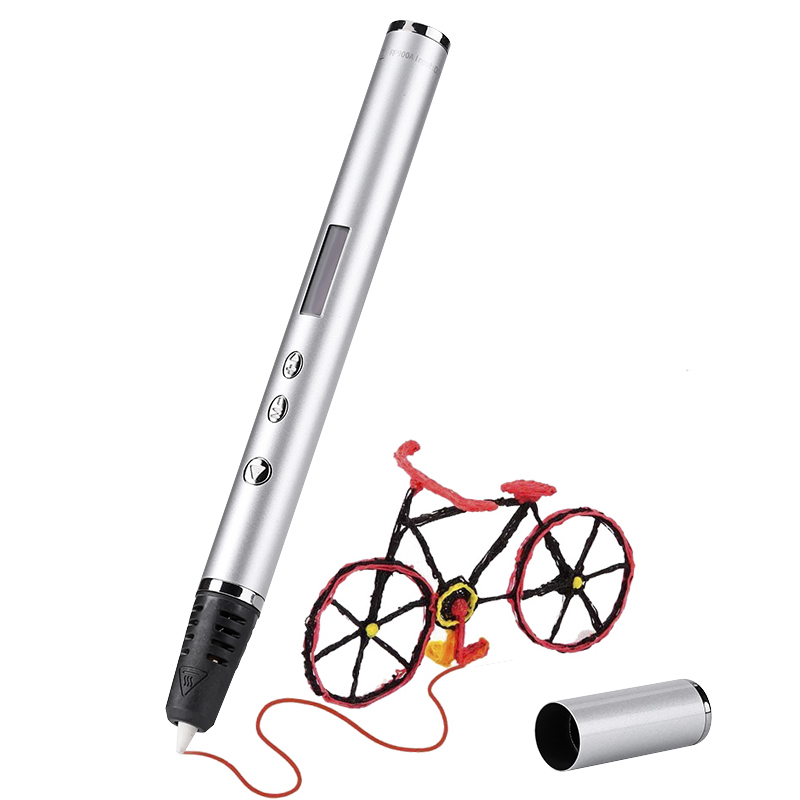 No matter what you have in mind, with this 3D printer pen, there are no limitations to what you can draw and create. Packing merely three buttons, this smart 3D printer is easy to operate, taking away the need for any prior experience. Perfect for usage in classrooms, at art projects, or simply for fun – this cool electronic gadget is guaranteed to bring along countless hours of fun and entertainment. With a printing diameter of 0.6mm, this pen provides you with highly precise results – allowing you to print whatever you have in mind no matter how complicated or detailed this project might seem. Thanks to its adjustable temperature, you will be able to customize your printing experience to your own personal liking by letting you choose from different filaments. Capable of printing both ABS and PLA material, this stereoscopic pen surely provides you with an abundance of printing possibilities. The 0.6mm ceramic nozzle does not only provide high precision, it also brings along safe and secure usage as it offers protection against the heat generated – truly making this 3D printer pen suitable for people of any age. Packed within the stylish design of this 3D pen is a small OLED display that constantly keeps you up to date about the current settings of your pen. This guarantees that you’ll always produce the best results. Increasing and simplifying your overall user experience even further is the pen’s automatic filament removal and refilling option – allowing you to change your filament automatically with the press of a button. Thanks to its Multilanguage customized design, this 3D printing pen can be used in your mother tongue by the vast majority of people all over the world. Coming with three strings of filament, this 3D printing pen lets you start your upcoming printing adventures straight away. Thanks to its revolutionary design, this 3D printer can be used both with its regular adapter or with a power bank – providing you with a truly portable device that allows you to print art no matter where you’re located. Whether you’re a hobbyist, high school student, or professional artist –the RP900A printer pen offers unlimited possibilities. Print art, make simple 3D figures or create highly accurate scale models, nothing is impossible with this stereoscopic pen. This smart 3D printer pen comes with a 12 months warranty, brought to you by the leader in electronic devices as well as wholesale electronic gadgets..
Arabic: - القلم الطابعة ثلاثية الأبعاد - Chinese Simplified: - 3D 打印机笔 - Czech: - 3D tiskárna pero - Danish: - 3D Printer Pen - Dutch: - 3D-Printer Pen - French: - Imprimante 3D Pen - German: - 3D Drucker-Stift - Hebrew: - עט במדפסת תלת-ממד - Hindi: - 3 डी प्रिंटर पेन - Italian: - Stampante 3D penna - Japanese: - 3 D プリンターのペン - Korean: - 3D 프린터 펜 - Malay: - Pencetak 3D Pen - Norwegian Bokmål: - 3D-skriver penn - Romanian: - Imprimanta 3D Pen - Russian: - 3D-принтер перо - Spanish: - Impresora 3D pluma - Thai: - ปากกาเครื่องพิมพ์ 3D - Turkish: - 3D printerlere harcama maddeler kalem - Vietnamese: - Bút máy in 3D.